VIPAccessEXCLUSIVE: Singing Sensation Leroy Sanchez Interview With Alexisjoyvipaccess At Vidcon 2017! When we hear the name “Leroy Sanchez,” we right away think of the stupendous, singing sensation who sweeps everyone off of their feet and leaves everyone on Cloud 9 with his unrivaled talent. The incredible Leroy Sanchez is truly one of the most gifted and talented musicians out. Hailing from Spain, the exceptional singer has and continues to make an everlasting mark all over the world with his remarkable music. In fact, Leroy Sanchez kicked off 2017 with an incredibly successful, international tour where he left everyone mesmerized with his indescribable talent and he gave fans a performance they will never forget. Leroy Sanchez’s success continues to skyrocket as the milliseconds go by. His YouTube channel has over a whopping 2 million subscribers and fans can’t help but swoon over all of his excellent videos – from fan-favorite covers of songs including “Despacito,” “Perfect,” “Beauty and The Beast,” and many more to original songs including “By My Side” and “Little Dancer,” both of which we continue to listen to on constant repeat 24/7. Leroy Sanchez’s accomplishments and great talent has been recognized at award shows, too. He has been nominated at the 2016 Premios Juventud as well as for a Teen Choice Award. It’s clear to see that Leroy Sanchez is taking over the entertainment world by storm and he has truly impacted the lives of many with his musical masterpieces. There’s always something amazing coming up next for Leroy Sanchez – the profound musician also just recently announced that his new single, “Man Of The Year” will be released on June 30th – another song of Leroy’s that we will be able to jam out to all day, every day. Despite his massive success, Leroy Sanchez remains to be so down-to-earth and genuine and he continues to show how much passion and hard work he puts into all of his projects. The sky is the limit for someone as extraordinary and remarkable as Leroy Sanchez and he will continue to establish himself as a household name. I, Alexisjoyvipaccess had the great honor of covering Vidcon 2017 again and had a brilliant time interviewing the multi-talented Leroy Sanchez at the event. Leroy Sanchez dished exclusively to Alexisjoyvipaccess all about what the creative process was like to make his new single, “Man Of The Year,” which musician he would like to create a song with in the future, and so much more only in our VIPAccessEXCLUSIVE interview. 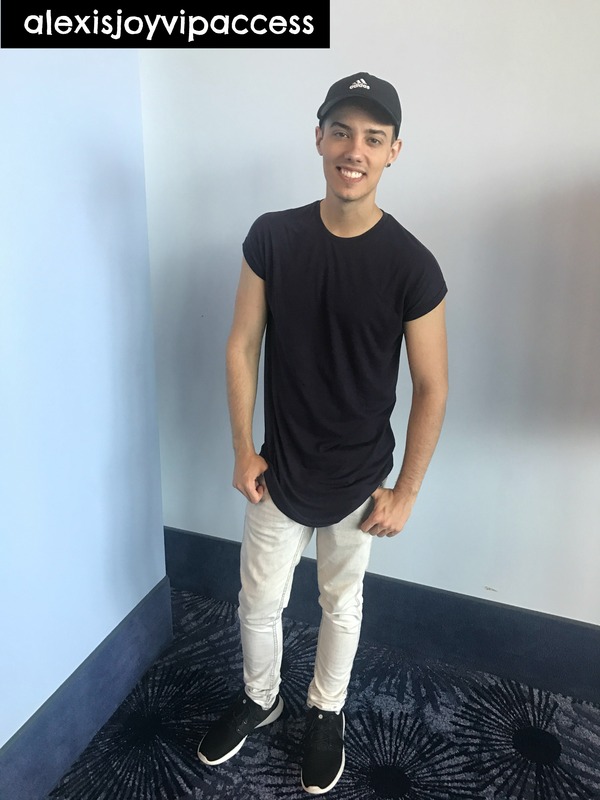 Leroy Sanchez even took on a fun speed round and revealed something that fans may not know about him, what his favorite song to sing in the shower is, what his favorite emoji is and more – hear what he had to say in our VIPAccessEXCLUSIVE interview below. Thanks for the terrific interview, Leroy! Check out my VIPAccessEXCLUSIVE interview with the outstanding Leroy Sanchez at Vidcon 2017 below! Previous VIPAccessEXCLUSIVE: Isaak Presley Interview With Alexisjoyvipaccess At The “Camp Cool Kids” Premiere! Next VIPAccessEXCLUSIVE: VidCon Made Online Video Making History Yet Again At Its 8th Annual Convention – Alexisjoyvipaccess RECAP!